Update: This bonus is no longer running at Bodog. Bodog now plays host to one of the biggest deposit bonuses available in the online poker world with the addition of the 100% up to $500 on top of its original unlimited instant 10% bonus. The bonus is essentially split up into two parts, where players will receive their first 10% unlimited bonus amount straight after deposit, and the second 100% up to $500 can then be redeemed from there on out. The second $500 bonus will last for 30 days, where after that period players will no longer be able to obtain any more bonus money. 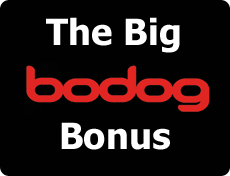 However, this is plenty of time to take advantage of the great bonus they are currently offering to all new depositing players, so head over to bodog and take advantage of it! Bonus Code: POKERBANK ← use this when you sign up to get the bonus. How the Bodog bonus works. 1. Deposit and Bodog will give you an instant 10% up front cash bonus. 2. Hit the tables and for every 10 poker points you earn in your first 30 days, Bodog will give you an additional $1 in bonus up to a 100% match of your first deposit up to a maximum of $500. How Bodog poker points are earned. 1. Rake: You earn up to 1 poker point per raked pot. 2. Tournament Fees: You earn 3 poker points per dollar in tournament fees. 3. Time Spent Playing: You even earn an additional 1 poker point per hour of play! Jim deposits $500 and receives a $50 cash up front bonus. His starting bankroll is $550. In his first 30 days of play, Jim earns 5000 poker points and receives an additional $500 cash bonus. Bob deposits $250 and receives a $25 cash up front bonus. His starting bankroll is $275. In his first 30 days of play, Jim earns 1000 poker points and receives an additional $100 cash bonus. Chris deposits $100 and receives a $10 cash up front bonus. His starting bankroll is $110. In his first 30 days of play, Jim earns 1000 poker points and receives the maximum $100 additional cash bonus. Bodog bonus terms and conditions. 1. Bonus is calculated based on your first deposit amount and poker points earnings during the first 30 from the date of your first deposit. 2. Bonus is issued only after your first 30 days from the date of the initial deposit. This is an automated process and bonus requests put in prior to end of your first 30 days will not be accepted. 3. Allow up to 48 hours for bonus processing. 4. Standard bonus rollover rules apply, 3 poker points per dollar in bonus must be earned prior to cashing out. You can also complete rollover by wagering through your bonus amount 3X in the sportsbook or 15X in the casino.